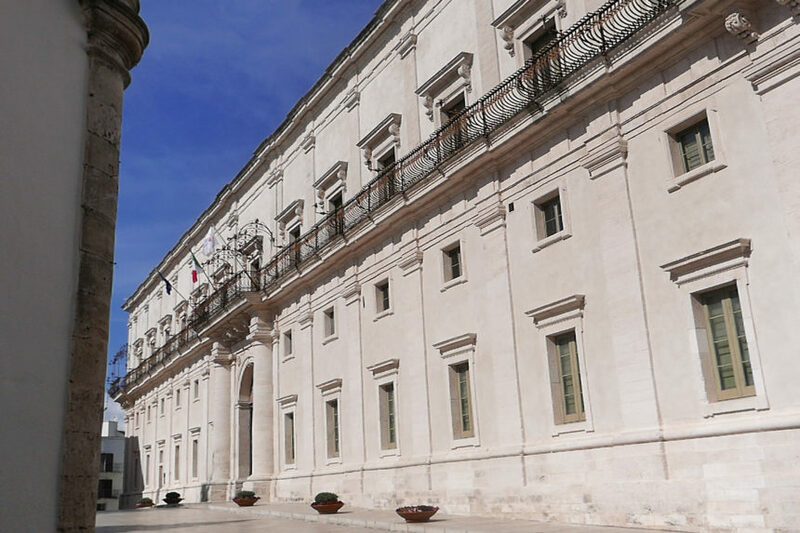 From the 16th July to the 4th August 2019, Martina Franca will reveal its musical treasures in the atrium of the Palazzo Ducale: Cimarosa’s Il matrimonio segreto, Manfroce’s Ecuba, Porpora’s Orfeo, and Offenbach’s Coscoletto marking the bicentenary of the French composer’s birth. “L’opera in masseria” will tour among the most beautiful settings of the area; and dance will be the protagonist of a special project in the Ateneo Bruni. The programme for the 45th edition of the Festival della Valle d’Itria is now fully ready: very early compared with previous years. Thanks to new strategic planning and development objectives desired by President Franco Punzi and the whole staff of the Apulian company, we are able to announce in detail the dates which will turn Martina Franca once again into a Festival city, observed and visited by the whole of Europe. The festival, dedicated to Paolo Grassi on the year of the centenary of his birth, will take place from the 16th July to the 4th August. The programme, prepared by artistic director Alberto Triola, is one of the richest and most interesting yet, under the title “Albori e bagliori. Napoli e l’Europa: il secolo d’oro” (“Dawns and blazes. Naples and Europe: the golden century”): a homage to Naples, the Neapolitan music school, and its international prestige. Two of the operas to go on stage at the Palazzo Ducale – Domenico Cimarosa’s 1792 masterpiece Il matrimonio segreto (16, 20, 31 July, 3 August) and the rarer Ecuba by Nicola Antonio Manfroce (30 July, 4 August) of 1812 – will be left to the expert hands of one of the greatest Italian maestros, Pier Luigi Pizzi, whose style is deeply rooted in the ideal of “beauteous simplicity”, so typical of Classicism. Honouring the tradition of the festival, the conductors will be young talents who are proving to be rapidly rising stars, such as Michele Spotti for Cimarosa, and of course there’s the festival’s music director Fabio Luisi for Manfroce’s rarity. The iconic space of the Palazzo Ducale will also welcome two further titles, in semi-staged form: Coscoletto, operetta set in Naples by Jacques Offenbach, marking the bicentenary of his birth (19th July) with an Italian premiere with the students of the Accademia del Belcanto “Rodolfo Celletti”, in a new rhythmical version by Sandro Cappelletto and Mario Desiati; directed by Arturo Cirillo, conducted by Sesto Quatrini. Also Orfeo, a pastiche by the Neapolitan Nicola Porpora (2nd August) directed by Massimo Gasparon and conducted by George Petrou, an expert in ancient music repertoire. This year, the much-awaited “Opera in masseria” will tour five different venues across the local territory (21, 23, 25, 27 July, 1 August). The work is of course connected to the Neapolitan music context, with the intermezzo L’ammalato immaginario by Leonardo Vinci, directed by Davide Gasparro and conducted by Sabino Manzo. After several years, a dance event is back on the programme of the Festival della Valle d’Itria (24 and 26 July) on the stage set in the atrium of the Ateneo Bruni. This is the ideal space for cross-contamination projects: after last year’s Elio and Rossini with the Carnival of Putignano and the Taranta, this year will be the turn of a contemporary dance and circus show – one of the newest, most promising artistic tendencies of the last few years. And of course how could we forget our Festival Junior? with C’era una volta… Robinson Crusoe, a loose adaptation of Offenbach’s homonymous operetta (22 July) – yet another occasion to celebrate the French musician. We also have two vocal concerts on the 28th and 29th July; we complete the bill with our customary shows in the cloisters and churches of Martina Franca with the series “Novecento e oltre” (17 and 18, 27 and 28 July), the “Concerti del sorbetto” (20 and 27 July, 3 August), the “Concerti all’ora sesta” (21 and 28 July, 4 August), the “Concerti per lo spirito” (1 and 3 August). As per tradition, the full schedule will be announced together with further details during the Festival della Valle d’Itria’s press conference in Milan. Dates will be confirmed over the next few weeks. First staged in Vienna in 1792, Il matrimonio segreto by Domenico Cimarosa (Aversa 1749 – Venice 1801) is one of the very few comic operas to be performed in European theatres, at least until the 1900s. It enthralled artists such as Stendhal, Goethe, Nietzsche. Today it is hardly ever performed, and yet it is considered one of the best examples of 18th century Neapolitan School, of which Cimarosa – together with Piccini and Paisiello – are among the best-known representatives. The story of Paolino and Carolina, a young couple secretly united in wedlock, and other characters will trigger a dizzying succession of events typical of 18th-century opera buffa. Ecuba is one of the few works composed by Nicola Antonio Manfroce (Palmi 1791 – Naples 1813). He was a great promise of the early 18th-century Italian music scene. He died when he was only 22 years old, in 1813, one year after the debut of his opera at Naples’ Teatro San Carlo. The protagonist of this masterpiece in three acts is the mythical queen of Troy, mother of the hero Hector killed by Achilles during the famous war narrated in Homer’s Iliad. Tragedian Euripides will dedicate two of his works (Le troiane and Ecuba) to this female character lacerated by a pain so deep that from it will spring the savagery of revenge with no redemption or hope. Nicola Porpora (Naples 1686-1768) was a prolific composer and singing maestro – he taught the likes of Farinelli. He made a crucial contribution to the dissemination and assertion of Italian Neapolitan opera in Austria and Germany. He was a virtuoso singing master, and among his works feature an Orfeo (libretto by Paolo Rolli, first staged in London at the Kings Theatre in the Haymarket on the 2nd March 1736), a pastiche – that is to say an opera performance featuring music by several authors – which besides Porpora’s own pieces includes others by Leonardo Vinci, Francesco Araia, Johann Adolf Hasse: today it is a precious document of the musical cosmopolitanism of the 1700s. First staged in Bad Ems in 1865, Coscoletto is an operetta by Jacques Offenbach (Cologne 1819 – Paris 1880). It is clearly set in Naples, and the sentimental affairs swing from naïve to mischievous. The author’s outlook shows he is well acquainted with the atmospheres described in the Grand Tour, and for the occasion he substitutes his famous can-can with the rhythm of tarantella. It was never staged in Italy, and we in Martina Franca are proud to present it in a new rhythmic edition by Sandro Cappelletto and Mario Desiati. The operetta unravels with character exchanges, infatuations, poison-administering physicians, pasta-makers, and the eruption of Vesuvius. “L’Opera in masseria” brings eighteenth-century music theatre in historic stately farms across the Valle d’Itria. We dedicate this space to the agile, juicy genre of intermezzo comico with L’ammalato immaginario by Leonardo Vinci (Strongoli 1690 – Naples 1730), a true star of the Neapolitan music school. It was composed to be performed in between the acts of Francesco Silvani’s Ernelinda (Naples, Teatro di San Bartolomeo, 1726). L’ammalato immaginario stages the typical hypochondria à la Molière. Don Chilone is tricked into marrying Erighetta, a cunning little widow who aims at a second marriage to climb the social ladder, and takes advantage of the fears of the ageing co-protagonist.